Hootsuite and We Are Social latest report "Digital 2019" reveals the impressive growth across all things digital. Let's take a closer look at the top line data you need to understand—mobile, internet and social media use. The current population of Europe is 846.0 million. 74% of the population live in urban areas. The number of mobile subscriptions exceeds the population in Europe. The total number of mobile subscriptions is 1.101 billion, equivalent to 130% of the population—meaning that on average people have 1.3 mobile subscriptions. Around 86% of the population use the internet. The number of internet users has increased by 7.5%, from 674 million in 2018 to 724.7 million in 2019. The number of social media users is 462.5 million; more than half the population of Europe. Facebook is the most popular social network. YouTube, Instagram and Snapchat are the most popular amongst millennials. Messenger apps such as WhatsApp and Facebook Messenger are becoming ever more critical as a primary way of communicating online. Information is incredibly easy to share with messenger apps! The annual growth continues, especially among active mobile social users in Europe, which implies that more people can access social media on the go. It has increased from 376 million in 2018 to 393.4 million in 2019–3% growth compared to the previous year. In a digitalised and “onlinified” world, marketers are facing ever greater challenges. According to “State of Inbound 2018”, a study by HubSpot, 61% of marketers say that generating traffic and leads are their leading challenges. Consequently, marketers are increasingly allocating more and more of their budget towards lead generation. The lion's share—45% of marketers' budget—is now allocated to lead generation, according to MarketingCharts. 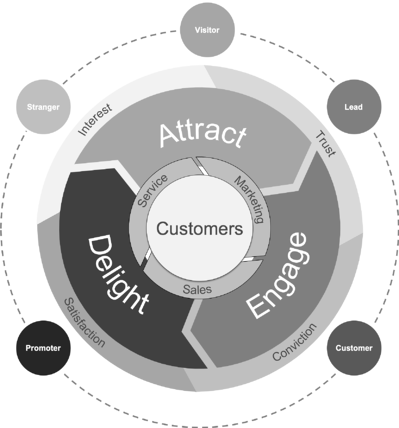 Lead generation and business results are the top objectives of the inbound strategy. Combining the inbound methodology and using software platforms will help to achieve these objectives and grow business. Meanwhile, all the leading software providers are competing to create the perfect—full ecosystem platform—to cater to the entire customer journey, from prospect to customer. HubSpot offers a full software platform for marketing, sales, CRM and customer service—plus the methodology, resources, and support—that helps business to grow better. HubSpot announced a brand new lineup of features in 2018 to give customers a more robust and sophisticated tool-set. It gives more control, greater flexibility, and deeper integrations—all without making life too complicated for you. Salesforce has long been known as a CRM software. It revolutionised the CRM software industry in 1999 with its cloud-based CRM solution, now known as Sales Cloud. Today, the Salesforce platform has extended well beyond its initial product. It brings together customer information in a single, integrated platform that enables B2B companies to build a customer-centred business from marketing right through to sales, customer service and business analysis. Oracle has invested heavily in the marketing segment, acquiring Eloqua, Responsys, BlueKai, and Datalogix. Eloqua is its main marketing automation platform. It aims to help B2B marketers and organisations manage marketing campaigns, and sales lead generation. Its features are grouped into five categories: Campaign management, Lead management, Reporting and dashboards as well as Sales and marketing alignment. Last year, Adobe acquired Marketo. The platform is now part of Adobe's Digital Experience business, which consists of Analytics, Audience Profile, Content Management, Campaign Execution, Advertising, Personalisation, Commerce and Engagement Marketing. The combination of Adobe Experience Cloud and Marketo Engagement Platform widens Adobe's footprint in customer experience across B2C and B2B. All these platforms are primarily competing for the same thing but have different legacy and philosophy on how to best help companies succeed in the digital age. The fastest way forward (and most effortless) for most companies will be to make a decision on one single platform—based on the best fit for the organisation—and try to limit the use of too many different tools from other ecosystems. Using many different tools from competing platforms will result in lots of time, effort and resources being wasted on integration and technological challenges. This is because connecting the tools and moving data between multiple systems take a lot of time and tend to fail regularly. Companies, therefore, end up spending most of their resources on solving tech issues rather than serving customers. As more and more people spend time in front of computers or smartphones—searching for information—Google search numbers continue to increase each day. Google now registers over 3.5 billion searches per day. If you want to know something, then you don't ask, you google! Consequently, Google is setting the agenda for a lot of development online. So let's check out what is new in Google. Original content from credible authors is becoming even more critical! Changes to the core concepts of quality and authority over the past year mean that Google is increasingly relying on “human quality raters“. Generating low-quality content—as a means of rapidly producing new blog articles for the sake of “content freshness—does not work anymore. SEO no longer rely upon re-purposing information otherwise found online (especially without citing one’s sources) as an effective and sustainable content strategy. To create a really effective SEM campaign today requires considerable knowledge and experience; choose an agency that specialises in Google Ads. One of the consequences of the updates is that Google ads will not be completely automatic. Experts who are familiar with the platform will readily take advantage of the new platform’s features, thus gaining an advantage over both manually created and automated ads. Video will become even more important in 2019! According to eMarketer’s newest forecast, online video ad spending in the US will reach $27.8 billion. Accordingly, it will constitute one quarter of all US digital advertising in 2018. Video will represent more than half of ad revenues for Twitter and Snapchat and 30% of total revenue for Facebook according to the forecast. There are of course many more digital trends to keep on top of as we move towards 2020, but these are some of the main ones that will have a massive impact on many companies this year. Want an extended digital outlook in PPT format? Then just hit the button below!